It is with regret that we record the departure of Captain Hugh Warren, who was with the Fiscal and Procurement Departments, to assume his new duties at Washington, D.C. The Edgemont Tribune; Nov. 26, 1947; Marvin Carson was guest of honor Monday, November 17th, at a farewell party given by the Fiscal Division. Carson, who has been employed as Chief of the Fiscal Division for nearly two years, is leaving to accept a position as Budget Officer with the Reclamation Service in Huron, South Dakota. Mrs. Carson will accompany him and they will make their home in Huron. The Division presented Mr. Carson a farewell gift. Pictured here are the personnel of Black Hills Ordnance Depot's Fiscal Division. Front row left to right - Alice E. Lott, Alice E. Tiffany, Hilda A. Heppner, Verna A. Stuen, Joyce A. Ferdig and Marcella M. Staley. 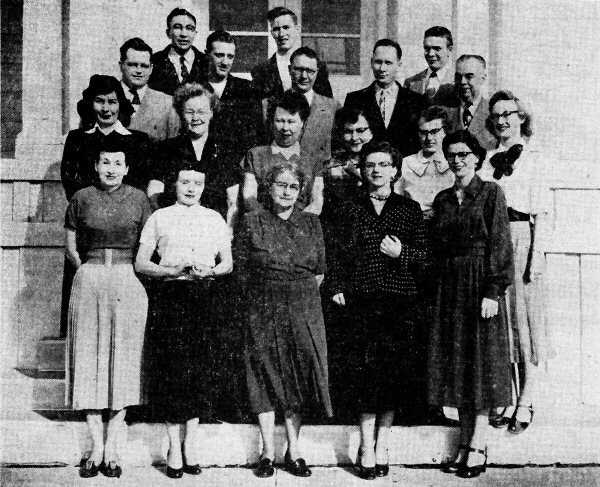 Middle row - James E. Coyle, Bonnie P. Reynolds, Orrine M. Cerveny, Julia E. Bingham, Patricia R. Morgan and Betty A. Hertha. Back row - Werner J. Poritz, George E. Barrett, John F. Staley, Wilfred E. Schweitzer, Ronald D. Hagen and Donald F. Karaus. Upon hearing the words "Fiscal Division", the average employee perhaps at once thinks of the Payroll Branch from which he obtains his check each payday. This check is concrete evidence of a function of the Division that is immediate and vital interest and concern to everyone on the Depot. However, important as the functions of the Payroll Branch are, the Branch is but one of five in the Fiscal Division, each having an independent character, yet all integrated into a smoothly moving organization that controls and admministers the funds allocated to the Depot. Under the administration of Mr. Donald F. Karaus, Fiscal Officer, and Mr. Werner Poritz, Assistant Fiscal Officer, the Fiscal Accounting, Commercial Voucher, Cost Accounting, Non-appropriated Fund Audit, and Payroll Branches perform the several functions of the Fiscal Division. The Fiscal Accounting Branch, staffed by Mrs. Alice Lott and Mrs. Hilda Heppner, maintains fiscal accounting records pertaining to funds available to the Depot, reports on the status of funds by appropriation and the rate of expenditure, and accumulates financial data which is reported to Army Area Headquarters and Office, Chief of Ordnance. This small but important branch carries the responsibility for accurately recording all Depot expenditures, this data being used by the Depot Fiscal Officer, the Commanding Officer, and higher command levels. Preparation of commercial vouchers for payments of accounts resulting from obligations incurred by the depot, and the examination and verification of all such documents as to propriety, mathematical accuracy and accounting classifications are the responsibility of the Commercial Voucher Branch. These duties, together with the stenographic and secretarial work of the Division, are performed by Mrs. Betty Hertha. Mrs. Julia E. Brigham, Mrs. Joyce Ferdig and Mrs. Verna Stuen of the Cost Accounting Branch are charged with the compilation, maintenance and recording of all operating costs incurred by the Depot, including cost of direct labor, pay of the military personnel, cost of materials, supplies and petroleum products, contractual services, etc. This data reflects the total cost of each depot division activity as well as the amount to be charged to each fund project from which the various activites are paid. The monthly Operating Cost and Performance report prepared by the Cost Accounting branch provides timely, accurate, and detailed information to be used at Depot level as the basis for budget estimates and for a review by operating officials of the cost of their respective activities, and furnishes Office, Chief of Ordnance, with pertinent and comprehensive data for use in analysis and comparison of costs of Field Service installations. The "eyes and ears" of the Fiscal Officer and the Commanding Officer for non-appropriated fund activities is Mr. John Staley, Chief of the Non-appropriated Fund Audit Branch. Auditing the books of the Civilian Welfare fund, the Post Restaurant, Commercial Communications, Concessionaires' operations, BHOD Officers' Mess and other sundry funds affords Mr. Staley an opportunity to "keep his ear to the ground" that would not otherwise be possible. In addition to his work with non-appropriated funds, Mr. Staley assists the Fiscal Accounting Branch and the Assistant Fiscal Officer in their duties. Payroll Branch, the largest unit of the Fiscal organization, is one with which employees come into direct contact since its functions are such that each and every person employed by the government at BHOD is vitally affected by its duties and responsibilities. Mr. James Coyle, as Time, Leave and Payroll supervisor, directs the preparation of payrolls for civilian employees, the maintenance of individual earning records, the maintenance and auditing of retirement records, the preparation of Bond Issuance Schedules and reports relating to leave, payrolls, bonds, retirement and tax deductions from earnings of civilian employees. Miss Bonnie (Pat) Reynolds holds the position of Payroll Control Clerk and maintains a control on all payments made to civilian employees. Her work also includes the maintenance of bond control the retirement control. 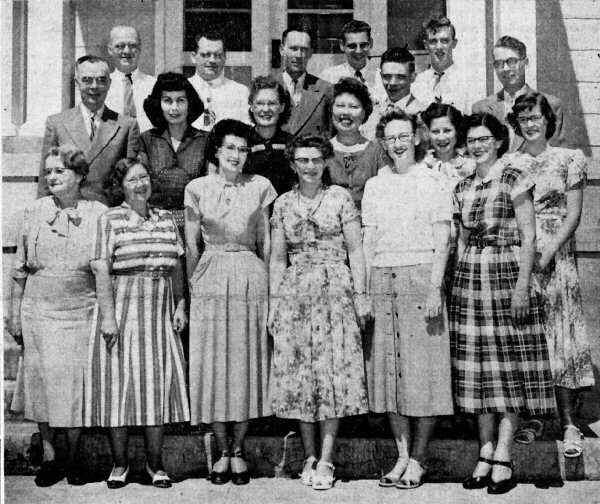 Mr. George Barrett, Miss Marie Cerveny, Mrs. Patricia Morgan, Mr. Thurlow Lorenz, and Mrs. Sally Staley act as Time, Leave and Payroll clerks; Mrs. Alice Tiffany has the responsibility of sorting, dispatching and distributing the paychecks as well as serving as clerk-typist for the Payroll Branch, and Mr. Ronald Hagen and Mr. Wilfred Schweitzer as Timekeepers, collect the time sheets from the foremen and check the time reported against the data on the employee's clock cards. From the basic data obtained from the time sheets and clock cards, labor costs are computed for all Fiscal and Payroll purposes. Reserved for the Fiscal Officer and the Assistant Fiscal Officer are the accounting, reporting, budgeting, estimating and all other financial administration and control over the use and custody of all appropriated funds available to the Installation. The difficult task of preparing the budget for the immediate future years requires close coordination with all Depot operations to determine the funds necessary to support all Depot activities. The special finding reports prepared by the Fiscal Officer are used in charting Depot trends and are utilized by the Commanding Officer and the Management Office for planning purposes. Thus it will be seen that the pay check which symbolizes the Division to the majority of the employees is but the end result of a detailed and complicated series of Fiscal operations that not only determines and acquires the funds necessary for the payroll, but for all other costs in whatever category for the continued operation of the Black Hills Ordnance Depot. and Thurlow Lorenz. Marie Cerveny, also a member of the staff, was not present when this picture was taken. Back in the days of the Roman emperors, the fisc was the royal treasury, derived from the Latin fiscus, meaning money basket. Today, with all the talk about fission, the average kid at school would probably connect fiscal with the atomic bomb. If one were to ask the Depot's congenial and highly capable fiscal officer, Scrooge, as he is often called these days, about this juvenile observation, he might say that the kid wasn't far off. To make ends meet at a time when pressure is being brought to bear to shave expense, Maynard Aderhold sometimes feels like he is ensconced upon a Hiroshima pineapple. Very few people associate glamour with a cold hard dollar, especially if it isn't one's own. But the fiscal group shown in the accompanying photo certainly is not wanting for glamour nor imagination, as well as a few other things such as honesty, ambition, and a sincere devotion to their dedicated duty. Though none of the group would appear to be frustrated nor do they seem to have psychopathic tendencies, suffice it to say, they well could since the fiscal routines have completely changed on two occassions since 30 June 1953 and another change in methods is fast on its way. However, progressive minded people, all, - they have converted rapidly and readily never missing a day of service to the depot. They were handed a verbal bouquet recently when a Washington, D. C., Accountant Supervisor labeled them the most accurately functioning fiscal group in the past eight months of operations from all Ordnance Depots. Julia Brigham and her two able helpmates, Verna Stuen and Joyce Ferdig, unwind over a mile of adding machine tape in a month, that's about 81,000 feet or better than 15 miles per year. All this just to figure out how, what for and where this depot's millions of dollars are spent. Might seem like routine to a lot of people, but the Cost Accounting Branch sorts and sifts figures to provide the basis on which our funds are issued and to give a breakdown of hours that justifies the existence of jobs and spaces. In the Fiscal Accounting Branch, Mrs. Lott has added enough figures just for transportation costs alone to total a miniature National Debt. She and the Washington, D. C., Transportation Finance Division resolve about a Million Dollars or so of Transportation funds each month. T. C. Lorenz has been given a needle nose pliers, a screw driver and a $7,000.00 synchromatic bookkeeping machine. With this equipment he performs most of his own maintenance so that daily postings of all fiscal transactions can be airmailed to government headquarters within eight hours from the time of their inception. Hilda Heppner and Mary Lou Heck help him accurately record these transactions into a key punch machine that produces the fiscal story for the entire Depot. The little spots of paper from the cards into which the holes have been punched, if saved for a year, would make enough confetti to serve the patrons at a New Years Eve Dance at the Officer's Club. Friend and faithful patron of the working man is none other that Jim Coyle. He cannot tell you off hand how many paychecks he has vouched over the years, but the last year's payroll approximated 4 1/2 million dollars. Ably assisted by Bonnie Pat Reynolds as a control artist, Clara Kennaley as a general hand of all trades plus his four regulars, Sally Staley, Ronnie Hagen, Marie Cerveny and George Barrett, they record every detail that affects your way of life from the standpoint of hours and dollars. There is an entire vault full of pay histories they have recorded. Suppose you thought that the "Outside Men" of our diggings were forgotten. Not as long as there is a taxi service. These gentlemen are staunch believers that cards must be clocked and leave slips supplied. They believe everyone is honest in keeping time, especially if it can be proved. And so you see them, Frank Vermillion and Al Ehrich, popping up anywhere on the depot checking time. Public relations as an established function is wonderful. You know how the Fiscal Office handles theirs? - Simple - Helen Amy prepares a voucher and sends a check to the venders who supply our depot. About 400 invoices a month go toward carrying an average $85,000.00 worth of goodwill to merchants all over these United States. Little Sue Royce sits, demure and coy, surrounded by three burdensome machines, any one of which seems to outweigh her by a pound or more. But to this day she has never lost a battle with any one of them as she pounds out the equivalent of a full length novel each month. It may be a "tiny" voice that says, "Fiscal Office, Sue Royce speaking" when you call 26, but it is backed by vim and vigor that produces a mighty effort. Many of those letters she types become the instruments which keep the wolf from the Ordnance Gate. When you come down the steps, turn left and look down the long hall. You see John Staley. He isn't called an "Assistant" as such, but he is a master coordinator, alibier and general handy man. Small or big problems are constantly tossed his way. Forty-six reports go over his desk in the course of a month, headed for higher headquarters. He hasn't missed a deadline in eight months and he has hit the stands with his products on both the west and east coasts. Never a dull moment. Individuals are equipped with the latest type modern machinery and desks. They are provided with the routine office supplies plus a 15 minute rest period each day. It is an established fact that the only difference between a broken calculator and the broken arm of an employee is the pain involved. The entire department has its efforts pointed toward the goal of performing, accurately and timely, their required tasks courteously and economically eight hours a day. Continual vigil is maintained to protect this nations two greatest customers, John Q. Public and Uncle Sam. How are the jillion and one things of this multi-million dollar extravagnza all coordinated? It's not hard - the simplist approach to a complex problem gets these things done. And how does this affect Mr. Aderhold - not too much for as he says, "Those 19 people out there, Red, sure make it easy for me to run this little show." Disbursing Office functions were established on a firm basis 3 October 1955. It was a big job and involved the complete cooperation of every member of the Fiscal Office. Congratulations are in order for Captain Metcalf and John Staley for the splendid manner in which this conversionn was accomplished. This is only the beginning. Within the next eight months there will be integration of the accounting systems. Such activity will involve a complete overhaul of past methods, wherein the responsibility for all Fiscal and Cost Accounting will be merged into the present system of Machine Accounting. This will cause the organization of another specific branch in the Comptroller's Office. The Budgeting and Accounting Branch. This Branch will be responsible for the coordinated preparation of directives and documents supporting depot needs, current and future, maintaining basic records necessary for adminstrative control of funds and the analyutical recommendations on budget estimates. Extreme stress is being placed on economy in all phases of depot operation. Management review and analysis internal control through compliance review and development of statistical data are methods through which the overall functions are appraised and reported. However, the coordination and cooperation of all depot employees is the essential keynote to a successful fulfilment of our mission.